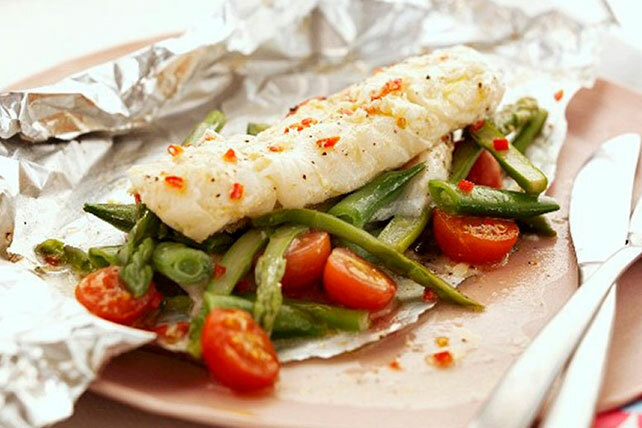 If there's an easier way to make moist and flaky fish than foil packs, we haven't heard of it. Grab some cod and heavy-duty foil, and let's get packing! Combine vegetables; spoon onto centers of 4 large sheets heavy-duty foil. Top with fish. Mix dressing and garlic until blended; drizzle over fish. Fold foil to make 4 packets. Bake 22 to 25 min. or until fish flakes easily with fork. Cut slits in foil to release steam before opening packets.